12 chickens in every garbage can and a gas guzzling car in every garage! This does NOT look good on our NATIONAL REUSUME', especially next to our National Adult Literacy Survey proving to the world how stupid we are, statistically. Mix-in our nationwide obesity epidemic and our huge public debt (and among the weakest GDP to public debt ratios in the world) and we ain't lookin' too good to the international community. One might say that we resemble an obese 12 yr. old with ADD carrying a loaded shotgun and wearing a plastic "World Police" badge made in China, who fronted allowance to buy the shotgun. Don't forget that 2/3's of Americans are fat and obese. That extra food is wasted too. Makes the real number closer to 80%. Waste is a funny concept. Waste, for lack of a better word, is good. America "The Beautiful", sorry I mean "The Wasteful"
"If" we are the problem. LMAO. Good one. Top THAT @bobcat(IAH). Well here is a thought. Quit subsidizing corn and other food!!! Let the market take it's course. Then we might also get healthier alternatives other than corn, corn syrup, and everything else made from corn. Great, they tell us how much we waste, without any real ideas on how to prevent said waste. Another useless report. A sell by date law. C'mon. 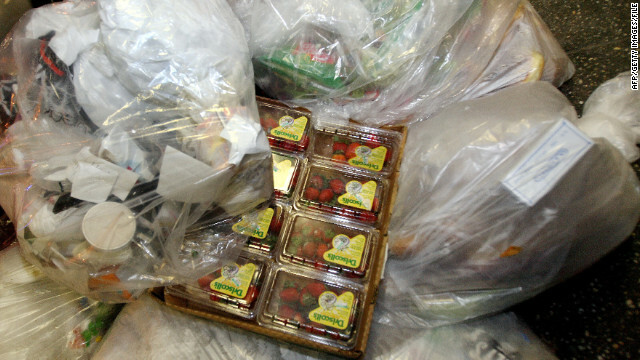 Great we can give garbage food, rather than fresh food, to the poor, costing more in health costs. How does this account for the fact that growers need to produce a large enough amount of perishable food to make it worth while, unless people want food prices to rise. Tell a farmer he has to cut his crop by 50 % because we waste it, but he can't charge more. And yet there will be enough to feed so many more. I'm guessing a more accurate conclusion is that it's all BS. Inflation began when coins were first minted. Greedy people would file the edges of ea. coin they had, eroding the actual value of the gold or silver coin. Banknotes helped, but are based on the idea that bankers are honest. Inflation is the result of greed, not waste. Wait a minuet what about all the food that doesn’t sell before its expiration date and has to be removed from, the shelves. I see things like strawberry’s that are practically spoiled on the shelves at a grocery store and are marked down , that don’t sell. How much of that is wasted because it never sold. I know dry goods are a different story. But what about foods that have a high spoilage rate how much does that account for, like produce or meats? Good Point. Maybe the strawberries would sell faster if they were the same price as a pack of cookie. I wish it was the other way around. Cookies and other sugary snacks $5. Fruits and veggies $1.99. I have long believed that supermarkets should take 1-5 day expired, prepared foods, 1-day expired refrigerated / frozen foods and give them to local charities with a clear exemption from liability (watch out for lawyers), and give them a tax write off. Food beyond these narrow but (get established) safe windows goes to the dumpster. This provides an economic incentive to get soon-expired foods out of the store to charity, where it is need, and saves the food from being wasted. Food is generally too cheap, thanks to the distortion of the market with the corn subsidies which gives us the unhealthy grain-fed beef, unhealthy high fructose corn syrup, and super-sized everything. Get rid of the corn subsidies,too. The USDA once paid farmers to not grow so much corn to provide a price support. The corn industry (ADM, Cargill, Monsanto) lobbied the USDA in the 1970s to change from paying not to grow to subsidies, and now we have an obesity epidemic, rampant Type 2 diabetes, and wasted food. Nice job there, government. I'm tossing a sandwich out in the street right now, just because I can. Got 99 problems, but food ain't one! Greenhouse gas emission, toll on water resources...how about the millions who die every day from sheer hunger. With this kind of waste here in the greatest country on earth we should effort towards getting this food to those who need it first and foremost. we dont waste a thing in our household, we shop once a week and eat it all until the fridge is empty, then shop again. If we waste $50 a year it is a lot, and we never eat out if we have enough at home. It is down to commonsense and coming from the North of England, where we ate everything and were creative with our cooking. My family look in the fridge and say it's empty, i look and make a great meal and suprise them everytime.